How did you end up at The National? I met Peter the summer before The National opened through a mutual friend that bartended downtown. We talked about food for hours and luckily he asked me to come over and help open the restaurant. 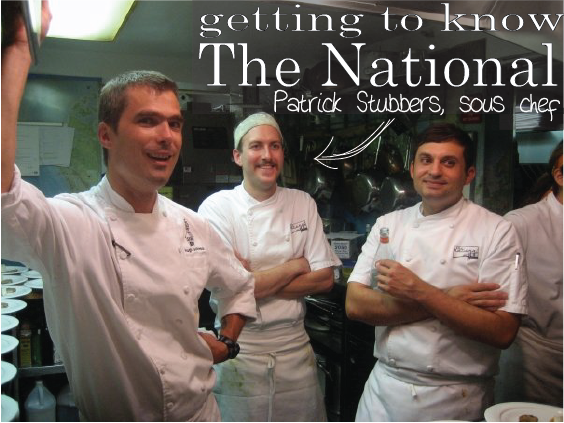 Outside of your experiences at The National, what has influenced your cooking style the most? I taught myself though many many books how to create and respect food, especially books by Thomas Keller and Harold Mcgee. And you were a vegan? Being a vegan for a few years taught me so much about flavors, and for that I’m thankful. But my passion for cooking ended up outweighing my diet. From there I started to cook and eat well-raised meat and fish. Does your sustainable food philosophy carry over to your work at The National? Of course. The great thing about The National is that we run a sustainable and environmentally-friendly seafood program and use local meats as much as we possibly can. What menu item is your personal favorite? There are so many I love. My year-round favorites would have to be the boquerones and all of our soups. In the summer i love the piri-piri grilled chicken with a black-eyed pea and rice salad. In the winter when we do slow braised short ribs we always create a truly delicious dish. But at the very top of my list is our house made corned beef sandwich, Reuben style…can’t beat it.